Copyright © 2015-2019 Yunit tech All Rights Reserved. We have participated in this competition since 2017 Nagoya World Tournament, so this is the second competition for us. From last year's competition, we examined improvement on our Robot's hardware and software using the information gained by participation in the 2017 competition. Here are our progress at the moment. In the article below, you can see the report of 2017 Nagoya World Tournament. Please take a look at the link if you have an interest. In the last year's competition, our robot equipped with crawler and represented prerogatives of it. The crawler system has very high ability to run rough terrain. In fact, In the last year's competition, we were easy to attainment to clear the Pipes-Test and Align-Test. But the design for 2017 competition has lots of issues. One of the most serious issue is the clearlance on the robot between left and right crawler. There are no crawler in this part and body frame is exposed. This messed up a trouble that the robot gets caught on the object in the field. The other issue is mainly due to the material of the crawler. The crawler we used in the competition in last year is Makeblock's gum crawler kit. This kit is actually very useful to build a robot for the plain of plain with small steps, but this crawler kit is too brittle to use for running on uneven terrain with intense irregularities. So we decided to design a new crawler system for this year's competition. This new crawler is designed to solve the problem about lack of durability and grip. In last year, we had the trouble that the gum crawler used in the four Flippers will come loose as it runs. So we changed the structure of the crawler to chain-based one from belt-based one. We also designed the sole to hook the prominnences of field, this mainly exerts its effect when running on the step field. This video shows the behavior of pre-assembled flipper. This is prototype model assembled in April 11th, and now we are already designed a new version for production use. All flippers are symmetry design, so when assembling, there is no need to consider where to attach the flipper for main body. 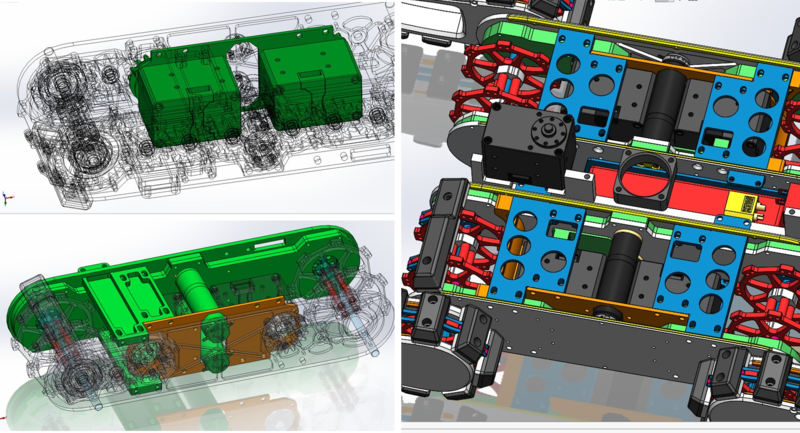 This is the 3DCAD Design of main crawler units, you see the two DYNAMIXEL XL430 servo motors and two RE16+GP16A Gearmotors. 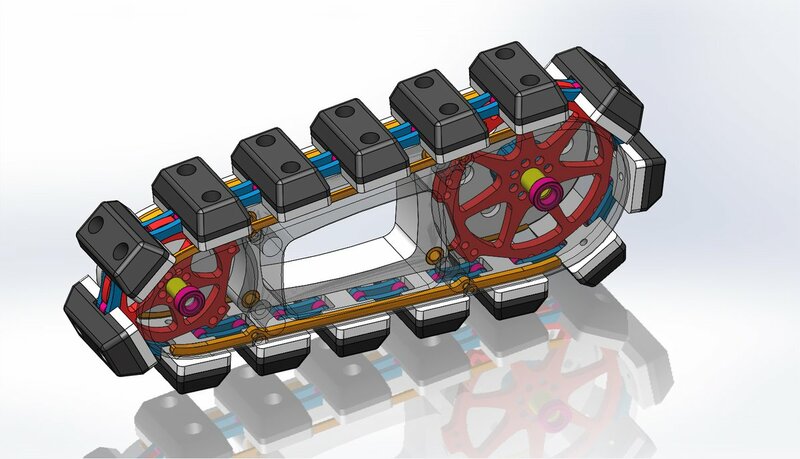 In this year, we drastically changed the actuators of main crawlers and flippers. 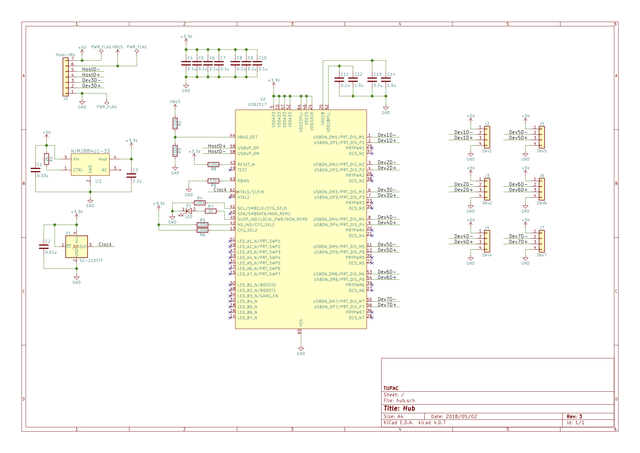 The servo motor we used in last year is SBRS-5314HTG , a PWM controlled servo motor for radio control car. 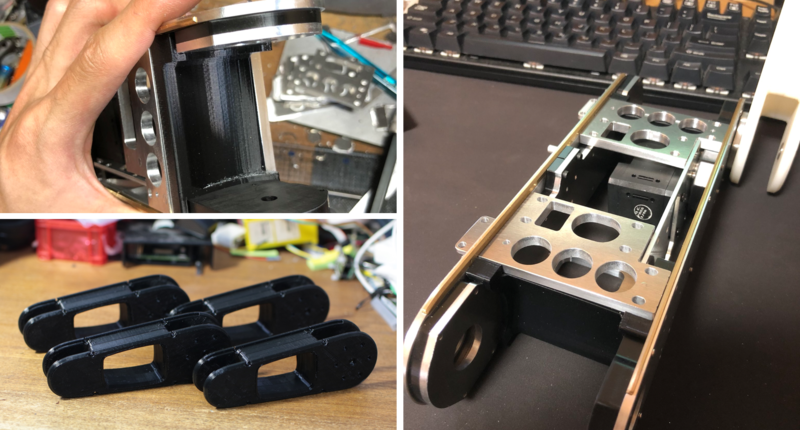 This servo motor had enough torque to drive the flippers, but there was a big problem in the accuract of the servo control and the quality of mechanical parts. We also used the RS-380PH + IG32 27:1 to drive crawlers, but it was too overspecific to overcome the RMRC participating robot. 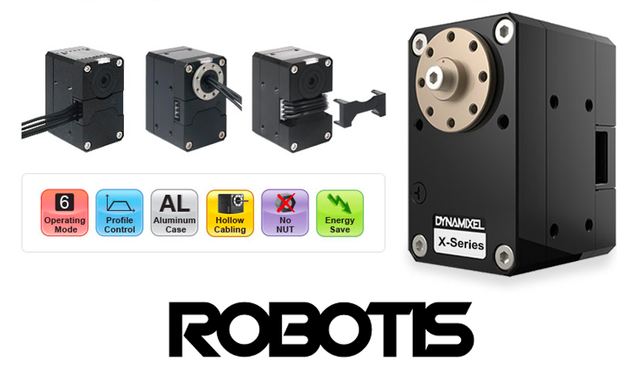 This year, we are using DYNAMIXEL XM-430 Robotic Actuator to drive the flipper and robot arm. This servo motor is designed for robot, so it has a lot of useful functions that are premised to be used for robots. 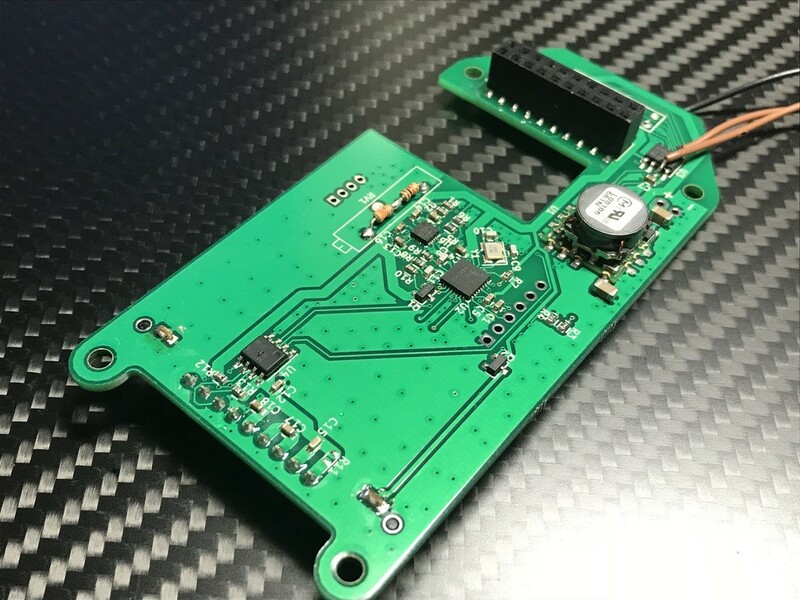 Unlike the conventional RC Servo motor, not only can change parameters of PID controller but also read and control torque using the built-in current sensor. Now we are assembling all the mechanical parts of main crawler and flippers shown the picture above. We used Policarbonate as the material of flame last year, but this year we plan to produce a higher strength flame to clear the falling task. Also, this robot is designed so that sand and cloth do not get inside the robot to protect gears and bearings. 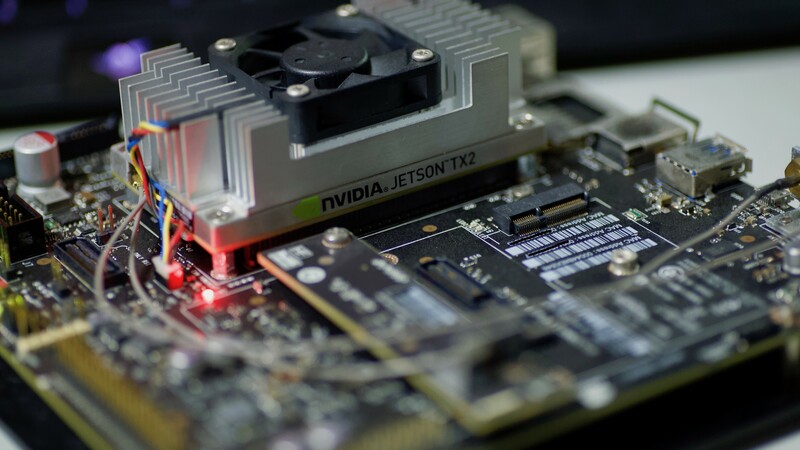 Our robot is equipped with NVIDIA Jetson TX2 as a main controller. 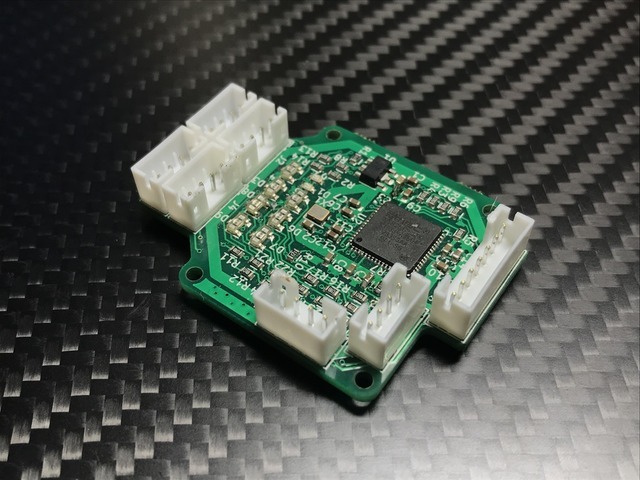 The carrier board is Orbitty Carrier by Connect Tech Inc.
We designed 3 electronic circuit to build entire system. We need to generate PWM signals to drive DC motors. But our NVIDIA Jetson carrier does not provide suitable ports. 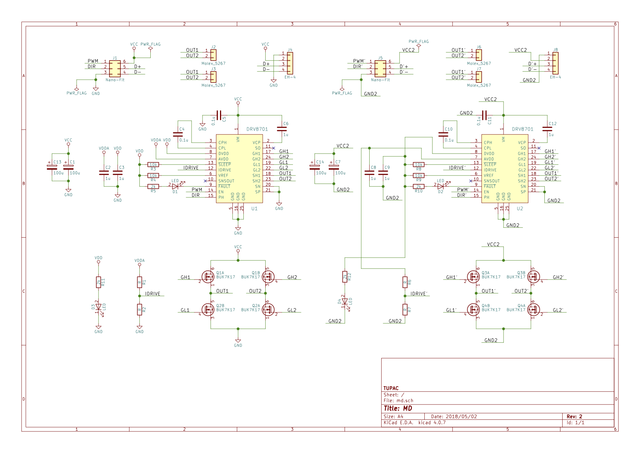 LPC11U35 on this board can generate PWM signals. 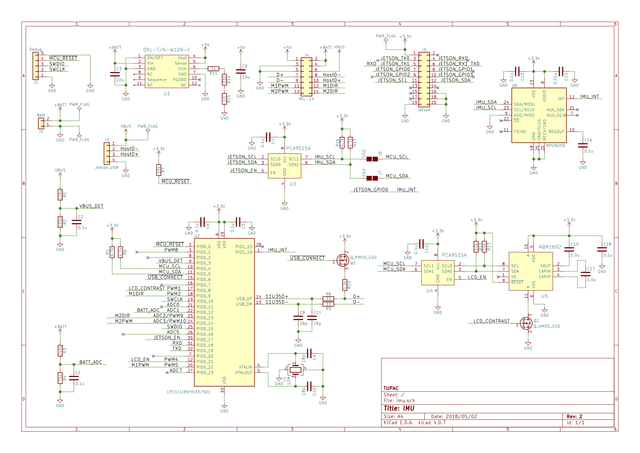 It is connected to Jetson via USB, UART, and I²C. Also, there is a character LCD to show messages. We plan to use it to monitor battery voltage. 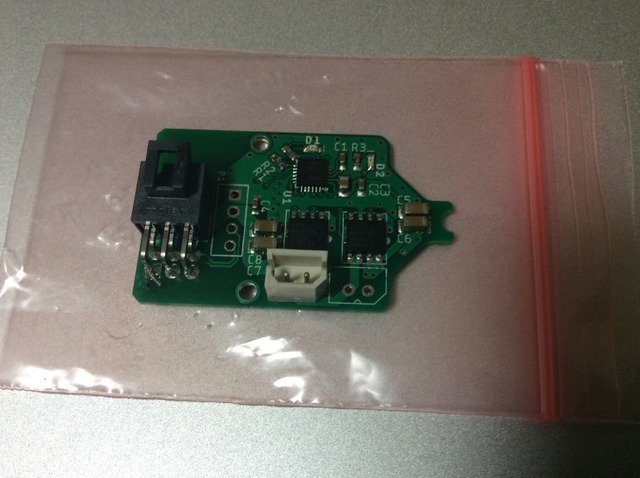 In addition, there is MPU9250 IMU to detect position. The lack of USB ports on single board computers is common. Our Jetson carrier is only equipped with two USB ports. So we designed a 7 port USB hub with IC called USB2517. Unlike usual hubs on the market, this hub uses JST PH connecter. This board drives two parallel DC brushed motors using DRV8701 gate driver and BUK7K17 N-Ch MOSFET. In the last year's competition, we cleard the minimum hazmatlabel recognition usin only color features, but we couldn't find the way to recognize all the hazmatlabels. 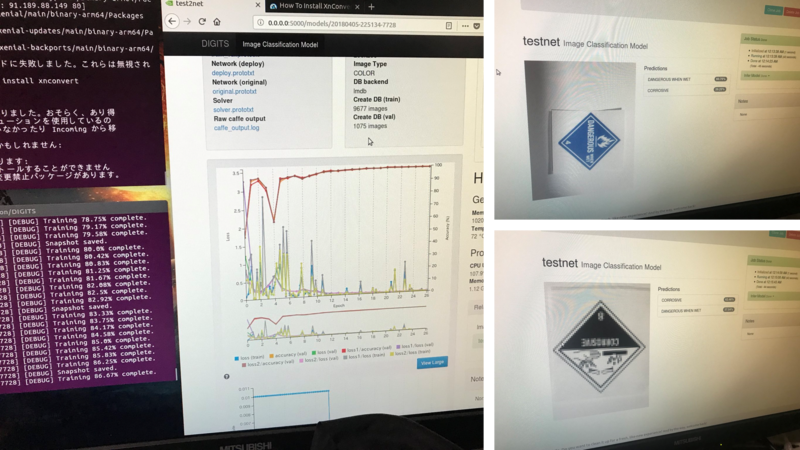 After that, we investigated how to perform the hazmatlabel recognition using finer feature points, and decided to use DIGITS, a GUI-Based Deep Newral Network development enviroment provided by NVIDIA. We've already tested a DIGITS and actually use it to recognize the hazmat labels taken by a camera which will equip to the robot. At the moment, the Deep Neural Network created by this process has insufficient ability to identify Hazmat label. We will continue to develop so that the robot can recognizes a hazmat labels with higher accuracy by convention. We understand we must publish all the resources of the Robot by the second day of competition. Since we are continuing the development of robots, it is expected that resources such as robot design data will be greatly changed. Therefore, I will try to prepare the open source for the second half of May when robot development is over.